It seems as though the societal shift toward “going green” has been taking over our way of life for quite some time now. But many people, including our own Greenville landscapers, are not convinced that using organic lawn care is the best way to maintain a beautiful lawn. So, is organic the way to go? While there is no simple answer as to that question, there are a number of advantages and disadvantages to look at before deciding which which method to use in Greenville. What benefits will using organic lawn care in Greenville provide? 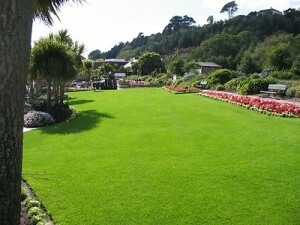 First and foremost, organic lawn care is much safer and healthier for the environment than most traditional practices. Using organic lawn treatment can also lower the amount of necessary watering, while keeping harmful pests and insects out. Organic lawn care provides an environment that helps feed the grass as well as the soil. What are the downfalls to organic lawn care techniques? It will typically take longer to see results by using natural fertilizer for your lawn. Organic fertilizer tends to be more expensive than chemical fertilization. “Green lawn care” relies heavily on microorganisms in the soil to break down the organic material. Organic landscaping in Greenville may not be the best fit for everybody, as it can be more time consuming and costly, however it has been proven to be just as effective and often preferred over traditional chemical fertilization. If you’re somebody who is concerned with the preservation of the environment, organic landscaping is a great place to start. Lawn Maintenance is an important part of most homeowner’s daily lives and who doesn’t want to help maintain our environment for future generations?